The following is a look back on seriously great foods we ate in 2010, presented in no particular order. Our top picks are from the Portland metro area, with Honorable Mentions and Travel Favorites listed below. Clearly, we both have ourselves a sweet tooth or two. 1) Pizza, Portobello Vegan Trattoria: First off, don’t worry, the gnocchi is coming right up. 2010 saw the re-opening of Portobello Vegan Trattoria in its very own, dare we say, near swanky space at SE 12th and Division. 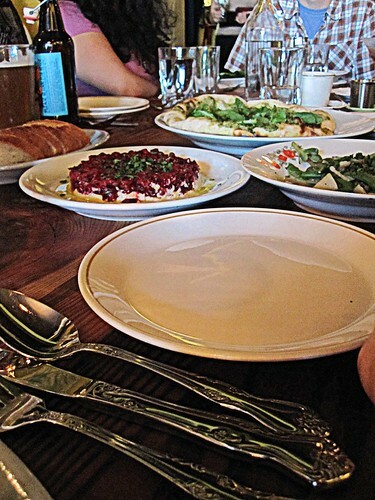 Once again, it became an instant favorite and Portland-vegan-must-visit. It’s become the place to go for birthdays, date night, family in town requirements, affordable fine dining, and simply great pizza. Their new pizza menu features thin yet chewy crusts, gourmet toppings and the bonus of Daiya or better yet, cashew creme. 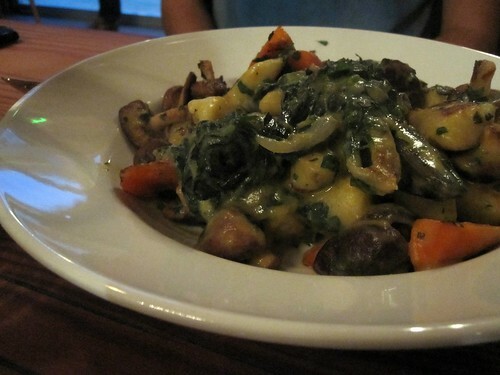 2) Gnocchi, Portobello Vegan Trattoria: The smooth, melt in your mouth gnocchi at Portobello is not to be missed. 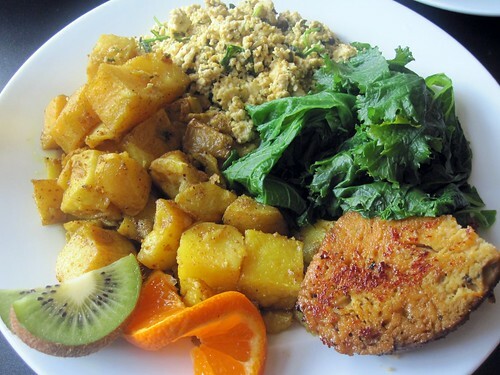 This dish alone helped raise the bar of Portland vegan food! 3) Khao Soi, Gin: Sweet, salty, sour, savory, silky smooth & crunchy. 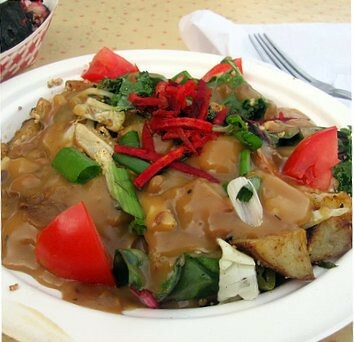 This dish has it all, and it’s served in compostable container with recyclable foil you’ll be licking clean! 4) Golden Gravy covered Breakfast Burrito, Kitchen Dances: Another great cart opened in 2010 (is this unstoppable? ), by Piper Dixon, formerly of Proper Eats. His rich, golden gravy is a serious contender for Portland’s best gravy – especially when it’s covering a local vegetable filled burrito. You know that old joke about eating a shoe? It’s up for consideration again. 5) Hail Seitan, The Fixin’ To: Thickly cut pieces of firm seitan in a sweet BBQ sauce, from a bar. What’s not to love? 6) MacNoCheese, Homegrown Smoker Vegan BBQ: Just saying – if this was available in school cafeterias, we’d have a lot more vegan children on our hands. It can be absolute comfort food magic – not to mention paired with a irresistibly smokey sandwich! 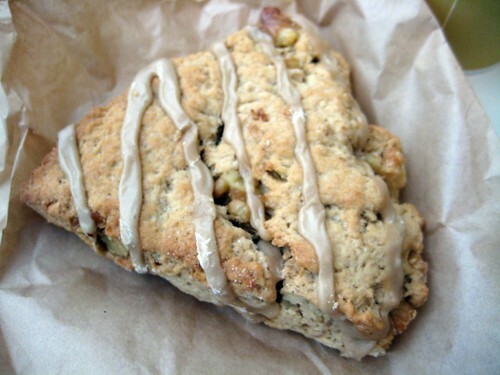 7) Maple Graham Scone, Back To Eden Bakery: A crumbly triangle of magic! Even served at room temperature, this bakery treat will taste warm with toasted walnuts, graham flour, and a maple icing that brings fall home. 8) BloLo Brunch: Blossoming Lotus is now open for weekend brunch, and before you start reading the menu and daydreaming about butternut hollandaise and seitan chorizo all morning, we urge you to stop in and try out some spelt biscuits, maple seitan, gorgeous greens, and some of Portland’s best tofu scrambles. This is Portland’s classiest (and all vegan!) brunch spot. 9) Cinnamon Roll, Dovetail Bakery: It’s so wrong, and so right, and by that, we mean it’s like unfolding layer upon layer of sweet, cinnamon love, and we know we’re sounding like creeps. 10) Mini Marionberry Pie, Petunia’s Pastries: It’s adorable. It’s topped with a heart and sprinkled with coarse sugar. It’s full of perhaps, Portland’s favorite fruit, and Petunia’s is now entirely gluten-free AND vegan. You can find their items at farmers market and Whole Foods. This year, the Stumptown Vegans have been traveling fools, heading coast to coast for both business and pleasure. And like most vegans we know, at least part of our travels always revolves around finding great vegan food! And because we know we’re simply two vegan writers, please let us know your own thoughts & favorites in the comments! I was surprised to see The Fixin’ Too’s Hail Seitan sandwich on this list…I tried it recently and the seitan was super spongy. Maybe it was just a bad batch, though. I’ll still be going there anyways because I loved the relaxed vibe and the cocktails sounded good. This is great timing, with us planning a Portland trip. Although as a gluten free vegan it looks like a few things are off limits but will have to try Petunia’s pastries! the Fixin’ To’s $4 small vegan Frito Pie is my bar food guilty pleasure.